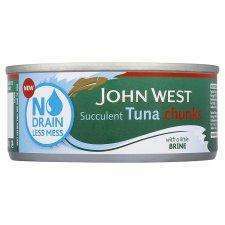 As title says, full size of John west no drain mess free tuna only 50p from £1.60 something. Bargain, as tuna prices have rocketed recently. Am assuming nationwide as had a proper rollback stock label thingy. Can't find the product at all online though? If this isn't a good enough deal for you then go fish! Does anybody else find the no-drain variety exceptionally salty tasting, compared to the 'messy' tins? Does anybody else find the no-drain variety exceptionally salty tasting, … Does anybody else find the no-drain variety exceptionally salty tasting, compared to the 'messy' tins? I haven't noticed to be honest, although we have the oil one as find brine saltier. This is good deal for the no-drain variety, true that the branded and supermarket tuna has shot up to ridiculous prices. However, ALDI sell a tin of tuna at their regular price of 55p! That's where I shop for tuna and its just as good in taste and texture, if not better! This is good deal for the no-drain variety, true that the branded and … This is good deal for the no-drain variety, true that the branded and supermarket tuna has shot up to ridiculous prices. However, ALDI sell a tin of tuna at their regular price of 55p! That's where I shop for tuna and its just as good in taste and texture, if not better! Is that the tuna chunks or flakes? I thought Aldi's prices had increased on their tuna lately. Looks like it's flakes rather than chunks if that makes a difference for anyone. Looks like it's flakes rather than chunks if that makes a difference for … Looks like it's flakes rather than chunks if that makes a difference for anyone. Not showing up online for me then. I haven't noticed to be honest, although we have the oil one as find … I haven't noticed to be honest, although we have the oil one as find brine saltier. Yes well brine is salt with water in it....LMAO!!!! Interesting reading though your sarcasm threw me at first. needs rinsing as ridiculously salty! Just picked up £5 pounds worth of tuna flakes from my local, John West tuna is £1. wow! my cats will love me hot!!! i bought some, my body is already **** just won't be giving it to my daughter. Plenty of lovely Mercury and other heavy metals too. Cold because stocks of Tuna are running low and this is a waste of good fish. Has to be in olive oil at least if its canned, and line caught. Better than wasting it on cats. Heat because I read "...no BRAIN tuna...". im thinking about ordering 50 to my house, delivered. Chunks, I never buy the flakes! I must admit, i've not done a tuna run to Aldi's for several weeks so i'm not sure. Is that the tuna chunks or flakes? I thought Aldi's prices had increased … Is that the tuna chunks or flakes? I thought Aldi's prices had increased on their tuna lately.Thanks OP. This stuff is awful, like fishy sawdust. Good if you're so lazy that the thought of tipping a bit of oil down the sink seems like an unthinkable ordeal. Bad if you like tuna. Tuna in spring water for the win! If you know how John West (& Princes) catch their tuna, and you have any concerns for the other marine wildlife killed in the process, you wouldn't touch their products with a fishing rod ! You should always buy 'line caught' tuna which you can get from Sainsburys, Waitrose & Marks & Spencer, as well as a few other smaller producers (it will state that is it fished by 'pole & line' on the tin). However, feel free to buy it as this price, as Asda are obviously not stocking it anymore, and the tuna and other marine life have already been killed, so it's better for the fish to be eaten, and not wasted. I've just completed my online shopping w Asda.com. 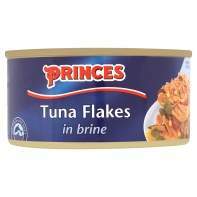 They have John West Tuna Chunks in both brine & sunflower oil for 50p.